What Is The Best Lawn Mower For You? Buying a lawn mower for the first time can be a little confusing, especially if you have no idea where to start. Luckily for you, this site will give you all the knowledge you need to go out and buy the perfect lawn mower for you (and your lawn!). My name is Lewis and I will guide you through all the jargon’s and complications around the world of lawn mowers and review the best lawn mowers on the market. With lawn mowers there isn’t a one-size-fits-all kind of deal, there are several different types of lawn mowers to fit different needs and gardens. The first (and most important) factor to consider is the size of the lawn you have. The bigger the lawn, the bigger the mower you will need. When it comes to sizing up gardens, many places use the example of a tennis court. Medium is the size of the tennis court, any smaller and its a small lawn. Any larger, you’ve guessed it! Its a large lawn. If you have a small garden then a hand push mower would be adequate, or an electric corded mower would make life easier. For larger gardens, it maybe worth considering a petrol mower or a cordless mower because the cord will get in the way and make the task harder. For very large gardens, it would certainly be worth considering a ride on lawn mower. This would relieve the effort on the back and legs standing and would actually be quite enjoyable. The Right Lawn Mower Can Make All The Difference When Mowing The Lawn. When it comes to lawn maintenance, it can be a difficult and a boring task. Many people do their utmost to avoid it for as long as they can because it is no picnic. This all changes when you have the perfect lawn mower for your lawn. It no longer becomes a chore and there is a sense of satisfaction to be had from it. If you have garden that you do take pride it then it may be worth spending a little extra to buy a high quality lawn mower. Not only will the quality lawn mower make your lawn look very good, it will enable you to do it with less effort than if you used a cheaper mower. Using this site, I will talk you through the various types of lawn mowers so you can find the perfect one for your lawn and garden. Lets start by looking at the different types of lawn mowers currently on the market. Different Types Of Lawn Mowers. Rotary mowers are ideal for family garden lawns where the surface maybe uneven. They are very powerful and will cut the grass regardless of the height or texture. The trade-off to the cylinder mower is that the rotary mowers will not give you quite the “groomed” finish that the cylinder motor can. If you want a lawn mower than you will use once or twice a year to tidy the garden then this is definitely the better choice. Rotary mowers can even give you that “striped” effect, for this you would need the rear roller attachment. You can get them to have adjustable heights to have it cut short at some areas and longer on others. You can buy them with a detachable grass clippings box to make disposing of the grass easier and saves you raking it up! Petrols mowers will give you more flexibility as they are cordless, as are the battery powered ones. If you have a very large garden, it may also be worthwhile looking at self-propelled lawn mowers, these can really take the effort away from you as they, as the name suggests propel themselves. Rotary mowers cut the grass by spinning a very sharp blade at high power. Hence the name rotary, for the rotation. These are the most popular and have the most variety available for them. Cylinder lawn mowers are perfect for flat surfaces and for grass that is well maintained. They are not very good on uneven surfaces or on grass that is too long or of uneven height. They are more expensive than other types and are an ideal choice if you do regularly care for your lawn as you get nice stripe patterns from them. They have a vertical barrel of rotating blades with a fixed blade giving the mower a “scissor” like motion. The barrels spins as you move forward catching the blades of grass between the blades in the “scissors” to cut. Cylinder mowers give a very fine and a “well groomed” finish to your lawn. The classic Cylinder mower didn’t have motors and so they were quieter to run. Modern versions with motor gives it more power and makes mowing the lawn a much easier task. You can get cylinder mowers in a variety of different cutting widths. Rear rollers will give that “striped” finish that makes your lawn look very nice. Detachable collection box will make it easy enable you to keep the clippings out of the way and then disposed of when the box is full. They can be found in hand-pushed traditional models, petrol powered or electric (battery/cordless or mains corded). Electric mowers are perfect for small to medium sized lawns. They are light in weight and easier to manoeuvre than petrol mowers. While electric mowers are lighter in weight, they would need a power source nearby or an extension lead. So it would always be worth checking the size of the cable that comes with the mower. You can, however, find electric mowers which are battery powered. This would eliminate the need for a cable to be trailing behind you as you mow your lawn and it would not constrict you in terms of how far you can go in the garden. You would need to make sure that the battery lasts long enough for you to mow your entire lawn in one sitting preferably. Electric mowers are easier to look after than petrol mowers. Hover mowers are just that, lawn mowers that hover over your grass – run on electricity. They hover on a cushion of air that enables them to “float” over the surface. They are quick and effective for smaller areas of grass on medium or small sized gardens. They can be heavier than other mowers and the quality of the cut would not stand up to that of other types. Hover mowers are good on uneven surfaces of your garden. They come with the clippings collection box attached or they distribute the clippings. The former would obviously add on to the price. Petrol mowers are more powerful than electric mowers. They last longer than battery mowers and so again, you have no cable holding you back. The smaller petrol mowers are lighter than electric mowers, the larger ones have a bigger cutting blade and larger collection box which make life easier when mowing larger gardens. Petrol mowers have the option of being available in self-propelled to lighten the effort required. They tend to be more expensive and require more maintenance than electric mowers but you do get a more powerful lawn mower for your money. Ride on mowers, otherwise referred to as “lawn tractors” are mowers that you can ride. 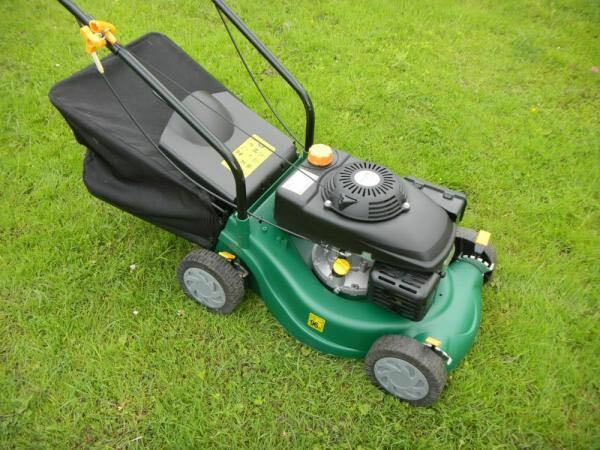 They are almost always petrol powered and perfect for larger lawns. These are very powerful and for larger lawns, they are the only reasonable option. Robotic mowers are lawn mowers that basically mow the lawn without any interaction from you. They are similar to the Roomba vacuum cleaners, you just set the mower up, they usually come with boundary wires which you set in the garden outlining the space you want mowed and it will do the rest for you. The wires act as a sensor so the mower doesn’t go trailing off. You can even buy robotic mowers that you can set the day and time to mow as well as an occurrence and it will do the rest for you. Ideal for when you are on holiday.